71 D�P�T G�N�RAL DE LA MARINE /VINCENDON-DUMOULIN, C. A. Carte G�n�rale de l'Oc�an Pacifique Dress�e Par Mr. C. A. Vincendon-Dumoulin. Paris, 1851-1865. Sur papier fort. Fente en bas du pli central sur 5 cm � l'int�rieur de la surface grav�e. Cachet sur l'Australie :"Cartes de la marine Imp�riale. AL. Debrie Libraire au Havre, Seul D�positaire".- Split in lower part centre fold 5 cm into engraved area. Stamp: ""Cartes de la marine Imp�riale. AL. Debrie Libraire au Havre, Seul D�positaire" on Australia. 620 x 910 mm. 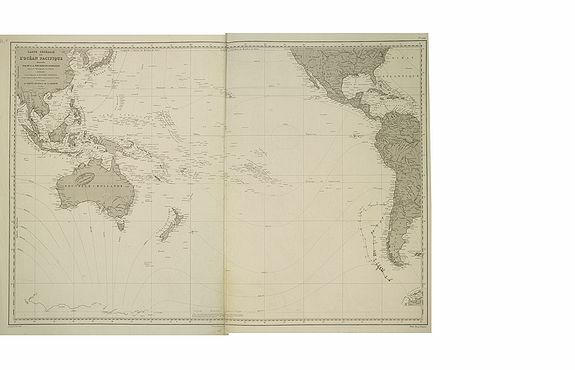 � Sea chart depicting the Pacific Ocean: shows the south east asian region and Australia. Routes are drawn in brown ink from Chile to Tierra del Fuego. Cl�ment Adrien Vincendon-Dumoulin (1811-1858), French hydrographer who served under Dumont d'Urville on his voyages to the south Pacific. It shows soundings, anchorage's, channels, shoals, navigational sightings.